Disc jockeys and musicians swear by Rock and Roller Cart’s usefulness. Music technology stores carry it very much like the regular instruments and paraphernalia in their product line. We’ve even come to think that it was designed for musicians and that was the reason for its rock-n-roll name. Studying the product in depth, though, we’ve learned that it’s an all-purpose cart not limited to transporting drums, keyboards, guitar, PA system, power amps, synthesizers, microphone box, and other musical stuff. It works for people who need to transport multiple items from their car to their work venue in one go. If you’re involved in photography, event organizing, diving, research and exploration, shows and performances, or film production, you know what we mean. Lugging as many items as you can carry, going back and forth, getting yourself spent long before your performance – you know the drill. It’s a waste of time and energy. So is the Rock N Roller Cart the game changer you’re looking for? What makes this product rock? Or does it? You’ll see in a bit. 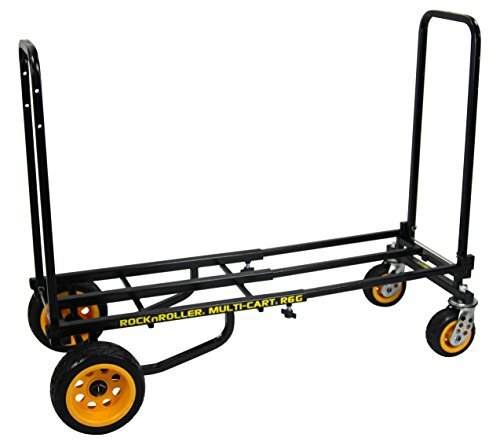 Rock-N-Roller is the maker of multi-use utility carts called the Multi-Cart, which is a winner of the Accessory of the Year award. 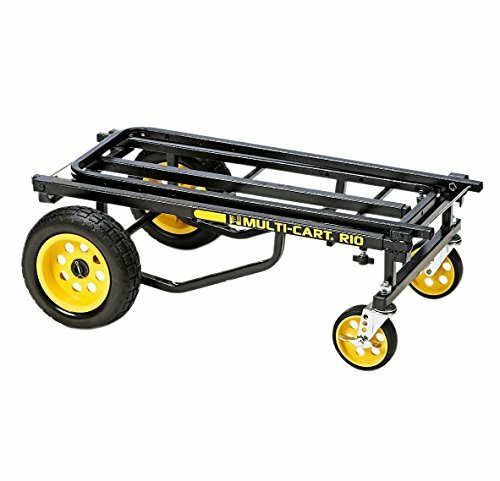 Multi-Cart has 10 different models, and R12RT is one of its newer and bigger versions. We’ve said this before, and we’ll not tire saying it again, Rock and Roller Cart R12RT saves you numerous trips. Some locations may require you to walk a fraction of a mile from the car pack to the venue. Certainly, juggling heavy equipment and repeating the act many times over is not something you’d relish doing before a show. So to us, the biggest draw of R12RT is its ability to move a trunkful of load. You’d be on time for your performance or event, with nary a sweat on your back. R12RT’s eight configurations make it very versatile. The long hi-stacker setup is a favorite among musicians and photographers. It stacks camera hard cases, photography lights, music equipment, sound and DJ gears and transports these valuable items safely. The bed frame has grip tapes which help prevent slippage. With some bungee cords and a fair amount of common sense, you’d have no issues negotiating curves. Yes, this Rock N Roller rolls. Rough or grassy terrain, ramps, or uneven floor – it has no problem with any of those. It even has a stair helper for tackling stairs. It would be wise to check for escalators or a lift first, though, unless you’d prefer to do some physical and mental calisthenics with the stairs. If you’ve tried the R8RT (Mid) or R10RT (Max) versions of the Multi-Cart, you’d feel the difference. Those older models work great on paved grounds, but if you’re a professional entertainer, service provider, or field worker, you don’t always get to choose your location. Note: an R12RT loaded near its max capacity may have a problem navigating muddy or sandy turf. As a rule, don’t load ANY dolly to its max capacity. We recommend loads to be around ½ of the stated capacity. Handy, compact, and maneuverable – even when loaded. It helps to know ahead of time the size of the lift. Nothing can be more frustrating than extending the R12RT to its full length, stacking it high, and walking it from the car to the lift only to find out that it’s too long for the lift. The bed frame is only 13.5” wide so going through the door is not an issue, just don’t let your cargo extend over the sides too much. It can be fitted with shelves and accessories to turn it into a photographer’s table, a DJ’s rack, or an exhibit shelf. It does mean added cost and setup time. If the added function is necessary to you, however, it’s definitely a perk you can’t miss. 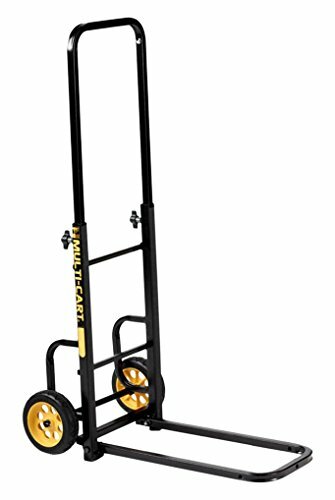 When you set R12RT as a cart or stacker, with either or both handles upright, you’d notice that the handles are not rigid. They have a sway in them. The slight give on the handles don’t seem to affect its function, though. 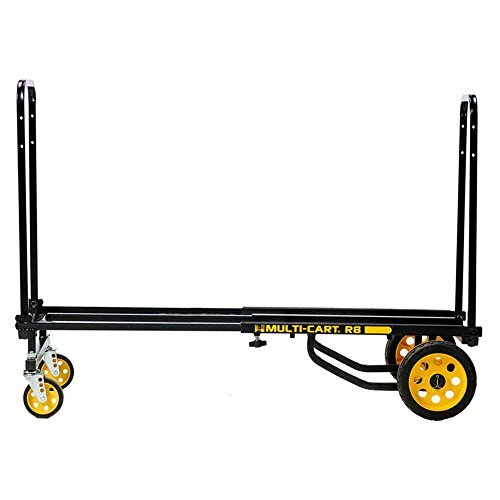 In fact, the more you load the cart, and especially if you secure your cargo with bungee, the sway disappears. We’ve mentioned that the bed frame measures only 13.5” wide, which is great for getting through entryways, hotel corridors, and kitchens. It works well for low stacks of cargo, but as the pile goes higher, this narrow width makes the cart less stable and prone to keeling over on its side. The instruction does say something about placing heavier loads near the rear, not the front. So consider yourself forewarned. The front wheels’ ability to move over rough terrain is greatly affected by the weight you put on it. Just don’t load the front part of the cart beyond 100 pounds – especially not on concert night – and you’ll be fine. You can fold down its bulk to the most compact, yeah, but it still weighs 33 lb. For some, heaving 33 pounds to and from their car’s trunk can be a real pain in the back. Well, some things you just have to live with, and this is one of those. It’s the tradeoff to the numerous trips you’d need to take to and from every location, not to mention the steel build that you wanted in the first place. Some buyers found manufacturing quality issues, such as parts and support struts that didn’t fit. In short, you may need to get some pliers ready and prepare yourself for some elbow grease. Just when you need the brakes, they fail you. Don’t they all, especially when loaded to the hilt? 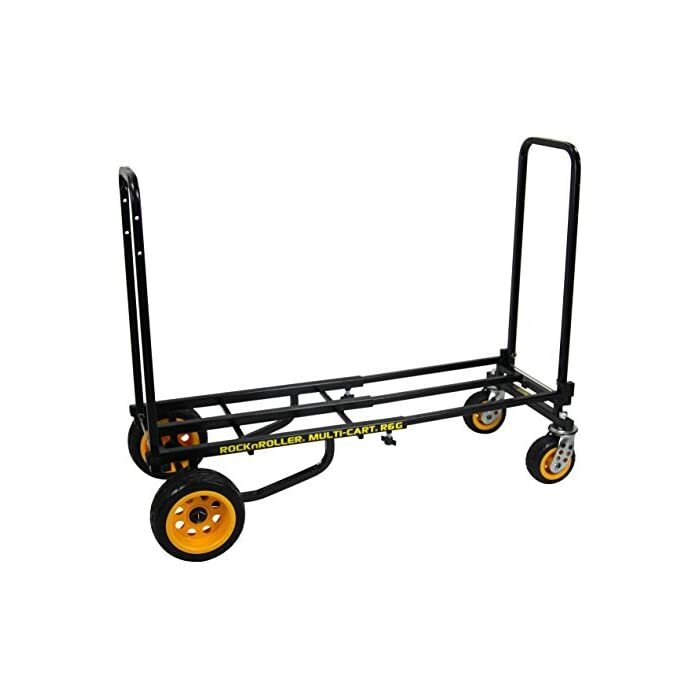 Of course, we expected more from a Rock N Roller Cart, but we also never load a cart to its full cap, especially when we know that there’s a slope ahead. So even when it says 500-lb max capacity, do your own judgment and keep on the safe side. This observation is from buyers who tried loading R12RT near its 500-lb max capacity. They observed sagging along the telescoping sides. But what else would you expect? Like we always said, load your carts only around ½ of its sales specs. An important accessory would be the shelves, but the manner to install and break them down for storage is counter-intuitive. Shelves are attached using wing bolts, and this design does not seem to be the best for it. If the maker finds a way to make shelves slip in and out easily, then that would markedly improve the experience of users. We’re not saying that this cart rocks everything, it doesn’t. It makes transporting your various items an easy ride with minimal trips, transforming to the shape and size of your load as needed. That’s what it does. As of today, very few products at this price point come up to the functionality and standards set by Rock and Roller Cart. Summing up, with all its flaws (as stated in the Cons), we find R12RT a clear winner. In fact, we don’t see any runner-up close by.